Since its inception, the sport of racing has captured the hearts of fans worldwide, inspiring emotions that reach far beyond the boundaries of the racetrack. Combining the essence of auto racing with a passion for beauty, Kevin Paige is a classically trained fine artist whose works celebrate the speed, color, majesty and spirit of motorsports. Founded in 2001, Kevin Paige Art brings to life each dynamic element of the motorsport experience. Kevin Paige has become one of the preeminent sources of original motorsport art by building passionate connections and dedicated partnerships in the professional racing community. Kevin's extensive portfolio encompasses all areas of professional and personal racing, on both a national and international level including: F1, American LeMans, Champ Car, IRL, DTM, Karting, NASCAR, ARCA, SCCA, Moto GP, AMA and World Super Bike. Bring home the thrill and emotion of your favorite motorsports moment with an original piece of art. Prices are made available through direct contact and are determined by medium and size. When interested in an artwork please complete the Contact Form and reference the work's title. We will contact you shortly with pricing information. Small watercolors start at $300 USD. Click to view the watercolors gallery. 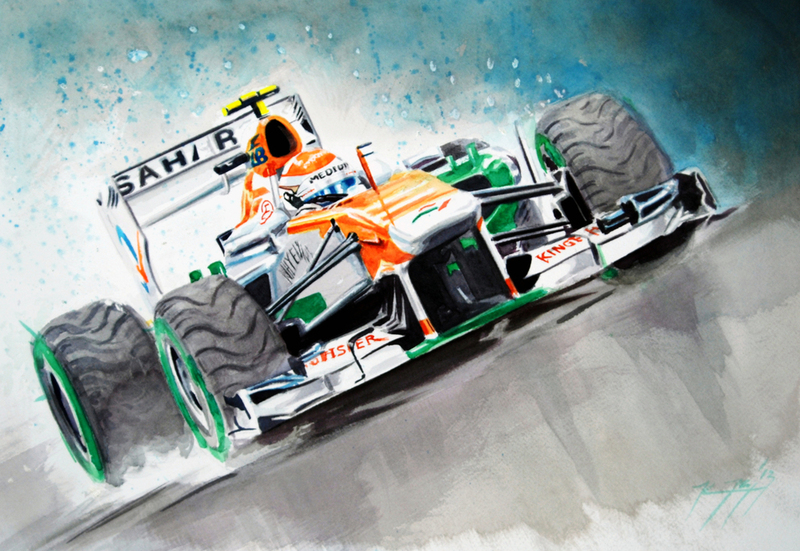 Kevin's watercolor technique aims to capture the momentum of motorsports. Visit the KPA Watercolors Gallery to view the complete collection. Click to view the oil paintings gallery. Kevin's oil paintings are bold expressions of his passion for art and motorsports. Visit the KPA Oil Paintings Gallery to view the complete collection. Click to view the drawings gallery. Kevin's drawings and sketches capture the essence of motorsports. Visit the KPA Drawings Gallery to view the complete collection. Don't miss Kevin's fun cartoons of driver personalities. Visit the KPA Cartoons Gallery to view the complete collection.